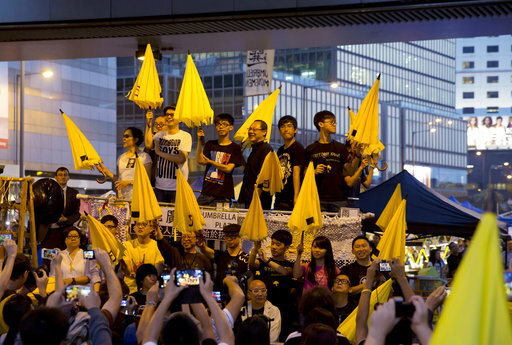 HONG KONG (AP) — A day after Hong Kong picked a new Beijing-backed leader, police launched a fresh round of arrests of student leaders and other prominent figures involved with the huge 2014 “Umbrella Movement” pro-democracy protests. Nine activists targeted by police were defiant as they turned themselves in at police headquarters on Monday evening, accompanied by dozens of supporters. Police notified them earlier in the day that they would be arrested and charged with committing a public nuisance, according to the Demosisto political party. Hong Kong police, who have arrested more than 200 people for involvement in the protests, did not reply to inquiries. The Department of Justice said police would prosecute nine people based on its legal advice. The arrests, which come more than two years after the end of the massive protests, could reignite political tensions in Hong Kong as the city prepares for its leadership transfer. Beijing loyalist Carrie Lam promised to mend political divisions after she was named Hong Kong’s next leader on Sunday, but the arrests have fueled fears of a wider crackdown on pro-democracy supporters amid rising concerns about mainland China’s tightening grip on the semiautonomous city. “We expect a large-scale political prosecution,” tweeted Joshua Wong, the young activist who helped lead the 2014 protests and co-founded Demosisto, one of a new wave of pro-democracy parties that advocate “self-determination” or even independence from China. Wong has already been taken to court several times for his part in the protests, but is not among those being targeted this time. Those targeted for arrest include two university professors, Benny Tai and Chan Kin-man, and the Rev. Chu Yiu-ming. They founded a civil disobedience campaign that helped spark the 79-day protests demanding free elections for Hong Kong’s leader. 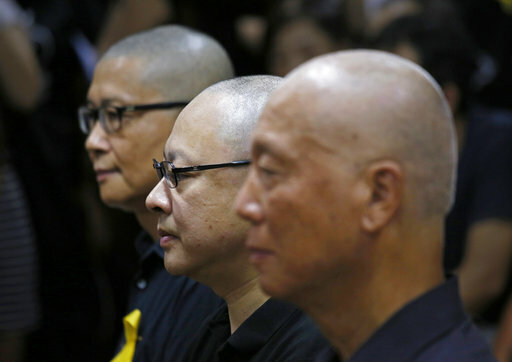 Others who surrendered to police include former student leaders Eason Chung and Tommy Cheung; a political activist; and three current and former pro-democracy lawmakers. One of the lawmakers, Tanya Chan, said that “after all these years, first of all the timing, it’s very strange. It seems to be a well-designed plan of C.Y.,” referring to Hong Kong’s current leader, Leung Chun-ying, who is highly unpopular because of his hard-line stance against the protesters. He will be replaced in July by Lam, who will take over a city split by political divisions and fears that Beijing is undermining the “one country, two systems” framework that promises Hong Kong high autonomy from the mainland. The arrests appear to have been timed to protect Lam, who was Beijing’s preferred candidate, from facing tough questions about the government’s crackdown during her leadership campaign, Amnesty International Hong Kong director Mabel Au said. “The authorities have had plenty of time to make this decision, so it does raise questions,” she said. Lam pledged “to heal the divide and to ease the frustrations and to unite our society to move forward.” But Tanya Chan said the arrests would make that more difficult.